The above did not work. Looked as if it was working but still had the old ver. Still opens the old ver. I am new to Linux and know I am overlooking something so any help would be a big help. Thanks for any help or advice. For Mint download the appropriate cqrlog deb file from this site. Find the file in the downloads folder on your computer. Right click on the file and the debi installer will pop up: follow the instructions to install. The next time you run cqrlog it should be the updated version. The debi installer can be used to update programs as long as the file you use is a deb file. to get the latest packages installed. It tells me I am up to date. I am trying to upgrade from v2.0.5 to 2.1.0. Thanks for all the advice that I have got but nothing has worked. I am new to Linux. I am running Linux Mint 17.3. Thanks again for any help or advice. HI Jim ,Iam using mint 18.3and have cqrlog 2.1.0 (oo1) installed.But when I try and reinstall with the debi installer it comes up with the same message. I cannot remember how I fixed the problem. I have set up another machine to investigate and will contact you if I find the answer. It may not be cqrlog but a non updated file in Ubuntu from which Mint is derived. Do you know you can update Mint by clicking on the shield next to the date/time in bottom RH corner and selecting File,this will tell you if an update is available. I just upgraded from Linux Mint 17.3 to 18.4. After the upgrade I was able to upgrade CQRLOG from 2.0.5 to 2.1.0. Now that is done it also updated MSQL to 5.7.20 so now MySQL will not work. It tells me I need 5.5 for it to work. Here is the last lines to the mysql config file. 171201 15:33:54 [Note] Server socket created on IP: '::'. 171201 15:33:54 [Note] /usr/sbin/mysqld: ready for connections. you probably have two MySQL client libraries installed. Use Synaptic or other package manager to remove old version completely. Would to thank everyone for trying to help me with Linux Mint setup. I just can't get it to work. 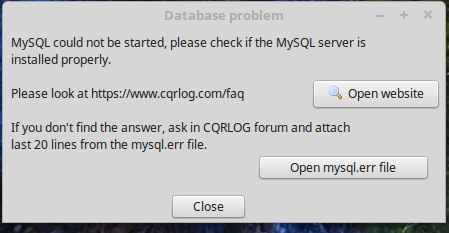 Every time I start CQRLOG it tells me that it is is looking for MYSQL 5.5 and I have 5.7. I don't know how to replace one with the other. I guess I am to old, (82) to learn a new OS. I guess I will go back to the Mac computer. I have WSJT-X and CQRLOG installed on the Mint computer but with the two MYSQL's it will not let me run CQRLOG. Thanks again for all that helped me get to this place. I like the looks of Linux. Do not give up! You are not too old. There is not a thing called "too old". If you can make MAC run use it for "relaxing" and having some qsos", but keep the linux project going on. nice in several OS. If you have never heard about it put word "teamviewer" to google. With that an Elmer could capture your screen and keys and make needed changes to your system as remote operator. You just need the Elmer. Probably living at same or near by time zone as you would be convenient. I have put Termviewer on my system and if anyone can help me with CQRLOG it would be a big help. I have WSJT-X working great and I have CQRLOG 2.1 installed and it tells me I need to have the right MYSQL installed and I don't know how to do it. If someone has the time and in my time zone or can log into my computer any time between 9 am to 5 pm EST it would be a big help. Have you had any assistace for your problem yet? I did install Lubuntu-17.10-desktop-i386 to an old mini laptop with 1Tb hard disk planning to make a simple low power file server with that. 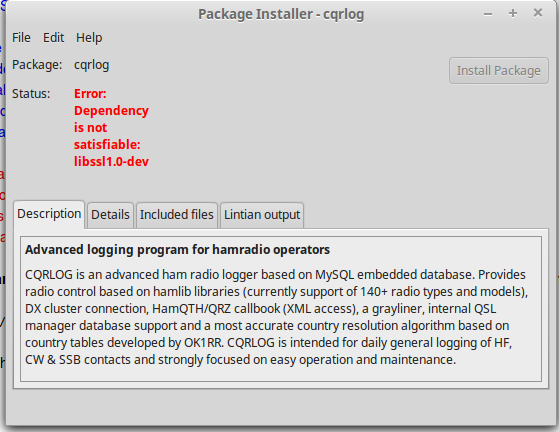 As there is now plenty of room I decided to try plain install of cqrlog for a debian based system. First installed Petr's repository with the command line from download page. While it was running I noticed that there was "error 404 not found" when it was seeking cqrlog repository. How ever, as a result, it installed version 2.0.5(001). I think it comes from some of ubuntu repositories, not from Petr's (as it caused error 404). That version how ever started ok. I removed the install and deciced to install from tgz-file cqrlog_2.1.0_i386.tar.gz. Then I got version 2.1.0(001) but at start it went to mysql error and did not run at all. I manually removed all files copied from tgz to get a clean system for next try. I installed again cqrlog from repository and got running 2.0.5. (001) again. After 2.0.5 was installed and tested to run ok I installed tgz over that install with the same console commands as above. It seems to be right way to act at this case. The good side doing it like this is that repository install does entry to start menu. Installing direct from tzg does not make a start menu entry. It has to be done manually. How ever installing first from repository and then overlaying tgz keeps the start menu in place and working. Did not get it going yet. It keeps telling my I have the wrong Ver of MySQL and I don't how to correct this problem. Thanks for trying to help. Did you try what I've posted before? It seems that after the upgrade there are both version of libmysql-client libraries 5.5 and 5.7. Use synaptic or uninstall libraries using apt remove libmysqlclient-5.5 or something like that. 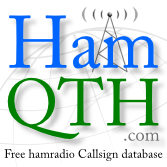 Thanks to all who have worked with me in trying get CQRLOG and WSJT-X working. I now have the two programs working and talking to each other. So again I say thanks for all the help and advice to someone who new nothing about Linux. Without you I would still be in the dark. I'm running a Raspberry Pi B+ with Raspbian Jessie. I've tried upgrading my cqrlog to both version 2.0.4 and 2.1.0. Neither will start. The 1.8.2 version will not allow me to change the time off field and if I update the LoTW and QSL manager lists, I get an "access violation" error and the program will not start. I have tried some of the fixes suggested and none of them have worked.